The San Francisco Bay Bridge’s 75th anniversary will be one to remember with a massive LED light show suspended from the four towers on the bridge’s west side. The entire span will be covered in 25,000 LED lights, which will be programmed to create an endless display of shimmering, streaming effects that are viewable from across much of the bay and downtown San Francisco. 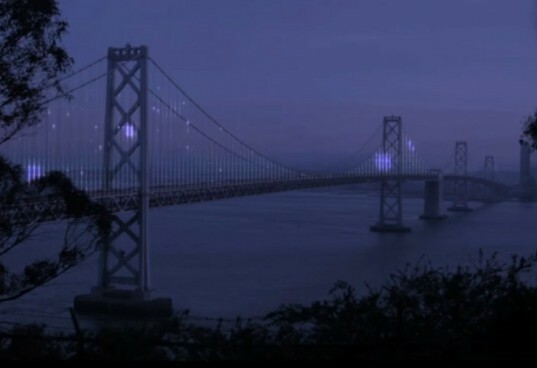 The work, The Bay Lights, is by artist Leo Villareal, whose penchant for sparkling light installations will be emblazoned for 1.5 miles on the iconic suspension bridge. The light installation, which will begin this summer, will continue through 2014 as a celebration of the bridge’s 75th anniversary and the opening of the new span on the eastern span. The programmed lights will display a shimmering, waving stream of effects across the span. Villareal’s work is very rhythmic, echoing the water it will reflect off of, which is very much the point— he says that the piece is intended to be a mirror of its environment. The lights will be set up on the north side of the western end of the bridge (closest to San Francisco), and they won’t be visible to motorists driving on the bridge. But if your out on a stroll on the Embarcadero, the display will probably be quite impressive. The privately-funded installation will cost a total of $5.2 million dollars, but $1.8 million still needs to be raised. Amazingly, the electricity costs are a only about $11,000, and those costs will be offset by solar energy credits, showing how energy-sipping the work truly is. The San Francisco Bay Bridge’s 75th anniversary will be one to remember with a massive LED light show suspended from the four towers on the bridge's west side. The entire span will be covered in 25,000 LED lights, which will be programmed to create an endless display of shimmering, streaming effects that are viewable from across much of the bay and downtown San Francisco. 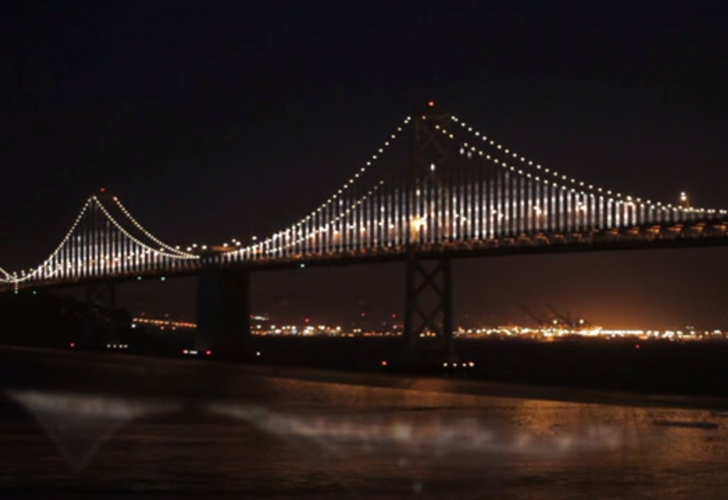 The work, The Bay Lights, is by artist Leo Villareal, whose penchant for sparkling light installations will be emblazoned for 1.5 miles on the iconic suspension bridge.